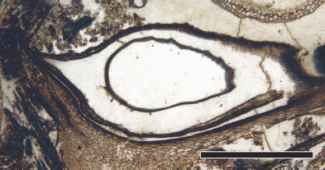 figure 9.101 Partial longitudinal section of Selaginella cone showing microsporangium (left) and megasporangium (right) (Extant). Bar = 1mm. the so-called resurrection plant. Recent studies based on gene sequence data suggest that the xeric and woodland species evolved from ancestors in the humid tropics, but today there is less resolution in classification schemes than there was earlier understood (Korall et al., 1999; Korall and Kenrick, 2004). The best-known fossil member, Selaginella fraipontii, represents an excellent example of the reconstruction of a complete plant based on isolated organs. For many years the generic name Paurodendron has been used for small (4 mm in diameter), anatomically preserved stems that are relatively common in coal balls from certain localities (Fry, 1954). The axes bear helically arranged, ligulate microphylls and are characterized by exarch protosteles that are stellate in cross section. The underground portion was subsequently discovered attached to a Paurodendron axis (Phillips and Leisman, 1966). It consists of an unbranched and unlobed, clavate rhizophore (root-bearing organ) from which helically arranged, monarch roots arose (FIG. 9.103). Despite the small size of the rhizophore stele, some secondary xylem is noted (FIG. 9.104). Reproductive parts of the plant are bis-porangiate cones that were initially described under the binomial Selaginellites crassicinctus (FIG. 9.105). Cones of this type are 1.2 cm long and ~5mm in diameter. Sporophylls are ligulate and attached to the axis in alternating verticils (whorls), each with four sporophylls. Megasporangia are restricted to the basal region of the cone, with each sporangium containing four or occasionally up to seven megaspores of the Triletes type. Microspores are assignable to the sporae dispersae genus Cirratriradites . Ultrastructural features of the megaspores are shared by modern members of both the Selaginellales and Isoetales (Taylor and Taylor, 1988, 1990). There have been a number of studies that have focused on determining the developmental processes involved in the formation of the complex spore wall (Hemsley et al., 1994). n organized production of laterals is a feature commonly associated with stems, not roots. The occurrence of this feature in S. fraipontii suggests homologies with the lobed rooting systems of a number of Paleozoic and Mesozoic lycopsids and may perhaps indicate a closer affinity with the Isoetales (Rothwell and Erwin, 1985; Bateman et al., 1992), or an intermediate status between the Selaginellales and Isoetales (Bateman, 1990). Modern-appearing Selaginella-like axes from the Rhaetian (Late Triassic) of Scania have been described as Selaginellites (Lundblad, 1950a). There are also numerous impression-compression specimens of anisophyllous lycopsids from Carboniferous rocks that have been described as either Selaginellites or placed in the extant genus Selaginella (Thomas 1992, 1997). Some of these, such as Selaginellites gutbieri, are represented as exquisite compressions that show the attachment of bisporangiate cones and details of the microphylls (Rossler and Buschmann, 1994). In this species, there appear to be at least six to seven megaspores of the Triangulatisporites type in each megasporangium; microspores can be assigned to Cirratriradites. Isolated S. gut-bieri bisporangiate cones have also been reported from Late Pennsylvanian deposits in the Czech Republic containing these same dispersed spore taxa (Bek et al., 2001). In Selaginellites primaevus (=Selaginella primaeva of Thomas, 1997), from the roof shales in the Saar Coalfield, each megasporangium contains four megaspores of the Triangulatisporites type. 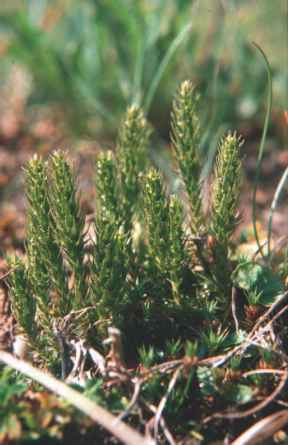 system is that typical of lycopsid cones, and the traces to the sporophylls have centrifugal and centripetal metaxylem. Spores are 240-320 pm in diameter, trilete, and evenly ornamented. The cones are thought to have been heterosporous, although no microspores have been discovered. Features of this cone suggest affinities with members of the Lycopodiales or Selaginellales; preservation prevents the recognition of ligules. The presence of Williamson striations between the scalariform bars of the metaxylem tracheids resembles some species of Drepanophycus; the Drepanophycales, however, lack heterospory and a strobilar organization of sporangia. 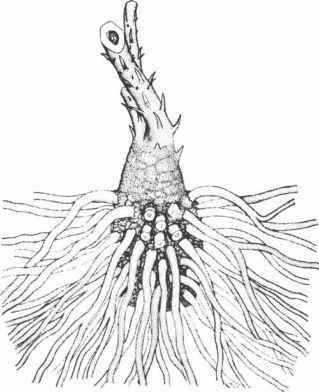 figure 9.104 Longitudinal section of Selaginella fraipontii (Paurodendron) showing rhizomorph (R), secondary xylem (X) and numerous roots (Pennsylvanian). Bar = 3 mm. the homosporous ligulate grade by the Middle Devonian (Hao et al., 2007). 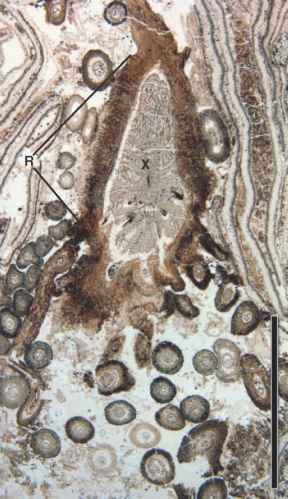 figure 9.105 Longitudinal section of Selaginellites crassicinc-tus showing both microsporangia (MI) and megasporangia (ME) (Pennsylvanian). Bar = 2 cm. figure 9.106 Longitudinal section of Miadesmia membranacea (Pennsylvanian). Bar = 1 cm. tentacle-like extensions that project beyond the distal opening. The sporangium is somewhat flattened on the sporophyll so that the opening is directed away from the cone axis. A large ligule is present just distal to each megasporangium. 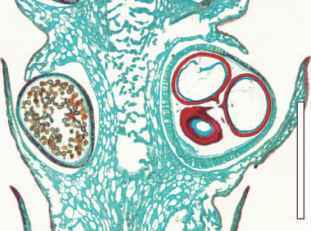 Miadesmia is interesting in that the sporangium contains one large, functional megaspore and some are known with a cellular megagametophyte. In the original description, it was noted that M. membranacea occurs in the same coal balls as specimens of lepidodendrids. 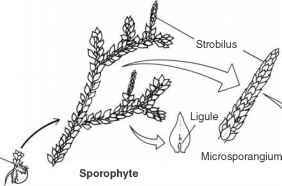 The small size of the sporophyll units has suggested to some that Miadesmia may represent a ligulate, heterosporous cone type within the Selaginellales that parallels the highly developed heter-ospory in the Lepidodendrales. 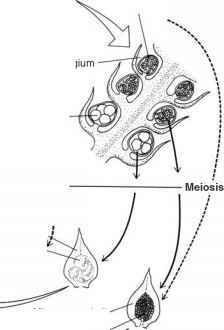 This theory is based on the presence of one functional megaspore per megasporangium in each group and the integument-like morphology of the lateral laminae.